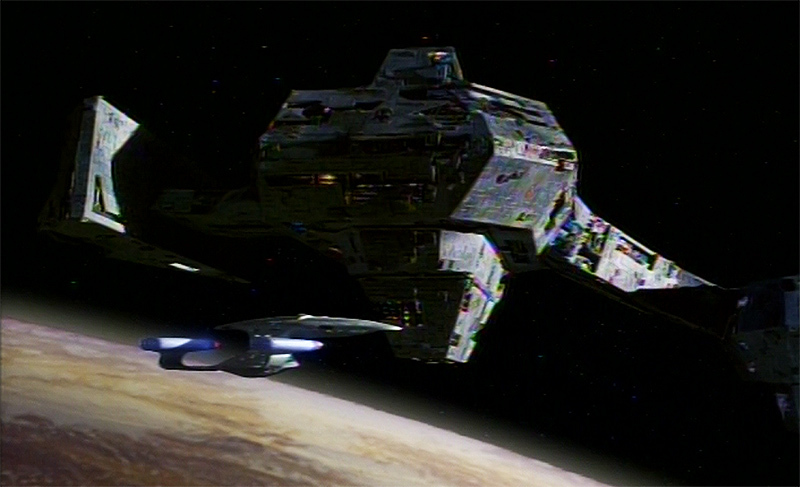 The Borg return in a badass ship that isn’t a cube in TNG’s sixth-season finale. I’ve posted the last three reviews of TNG‘s sixth season. And thus ends my Summer of Season Six. Stay tuned for the Fall of Season Seven. And I’m not phrasing that in some ironic double-meaning kind of way as to imply that season seven will somehow fall down. Because I wouldn’t do that. Find out soon. I’ll be back with more reviews in a week or two. I’m not planning to take a break between seasons. I’m planning to dive right on in and keep this moving. After all, I’ve got to finish TNG before the world ends in December. At the pace I’m on since starting season six, I’m not on track to make it. Damn you, Mayans! You have denied me completion of my entire-Trek-canon review — something that has been in the makings since right after I graduated high school! Good work and good luck Jammer. Season 7 is *rough* road. I mean, people grouse about seasons 1 and 2 of TNG; but 7 has a lot of bad patches. However, it does have “Lower Decks” and “All Good Things…”. But, I hope you finish by years end. That would be something that’s worthy of a TrekToday article, I’d say! Season 7 does have a lot of ups and downs. Very inconsistent, but when it was on, it was really on. Some good episodes (Gambit was TNG trying to get down and dirty like DS9), but also Parallels, The Pegasus and All Good Things. lower decks is an all time classic. I agree season 7 was uneven but produced some great episodes. Mainly ones mentioned above. Am really curious to see Jammers take on Gambit, Parallels, Pegasus. But if there’s anything short of 3.5 for All Good Things…well…you an me Jammer…we needs to have a lil talk. :p Easily 4 star and best series finale (for Star Trek) out of the others. Yes DS9 is by far my overall favorite series and that’s no secret on here but its finale, tho great, was not quite as “befitting” as TNG’s if that makes sense. Ironically enough, TNG was supposed to have an 8th season but Paramount dropped it for TNG movies but the finale was great. DS9 screamed for an 8th season at the end but one was never planned (though from what I heard the idea was being tossed about). I was debating keeping this hidden until Jammer posted his final TNG review, but decided those curious would be interested in having a look. It will be interesting to see if many (or any) of these ten-scale rankings will reflect a final four-scale rating when Jammer finishes re-watching the episodes. Those ratings were probably based on reviews I wrote for TNG season 7 the summer after it finished airing, which were actually the very first Trek reviews (along with DS9 season 2 that same summer) that I ever wrote. This was the summer before I went to college and first had access to something called the Internet. Those reviews (as well as the DS9 ones, which I rewrote later) were never posted online. I actually compiled them into paper books and put them on consignment at a local comic book store in 1994. While I still have them on my hard drive to this day (and even have some of the actual books), I probably haven’t looked at them in well over a decade, mostly because it’s too embarrassing to read them.